Spanish Mild Chorizo, dedicated to authenticity, prime ingredients and of course, flavour. 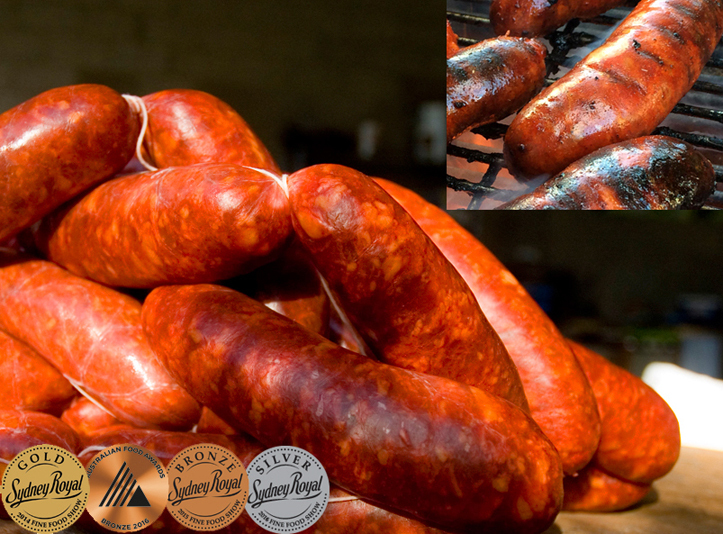 Using primal cuts (muscle trimmed of secondary fats), and back fat of locally sourced NSW pork and high quality Spanish spices, we have produced our ‘award winning’ La Boqueria Chorizo, to retain the flavours and aroma as close as possible to Spain’s very best own. Chorizo is a cured sausage, (either air dried or smoked), consisting of minced pork, and spices. Primarily from the Iberian Peninsula, the origin of the word is uncertain, though according to the latest amendment of the Spanish language dictionary of the Spanish Royal Academy, it perhaps comes from the Latin "salciccium". The length of time the Chorizo is cured depends of the intended usage. To grill, or lightly fry as a hot tapas, the chorizo is cured so it loses less weight, still retaining a moist flavoursome centre. To slice or to use in stews, it is cured so the weight loss is greater. This intensifies the flavours and develops a sweet dryness, characteristic of meats cured with high quality paprika. The most important spices in making Spanish chorizo are paprika and garlic, these spices give the chorizo it’s aroma and characteristic red colour. The skin of the chorizo is usually the small intestine of the pig, the large intestine is used for the variety of chorizo, "cular". Among the varieties of chorizo there is the famous Cantimpalos (IGP) as well as those of Pamplona (which are characterised by using a blend of coarse and very finely minced meat). Other famous chorizos can be found in the province of Salamanca, and in La Rioja (IGP), Potes (Cantabria), León, Asturias (usually smoked) and the typical Txistorras, (small moist chorizo) from Navarra. All these chorizos are known by the name of where they originate from.